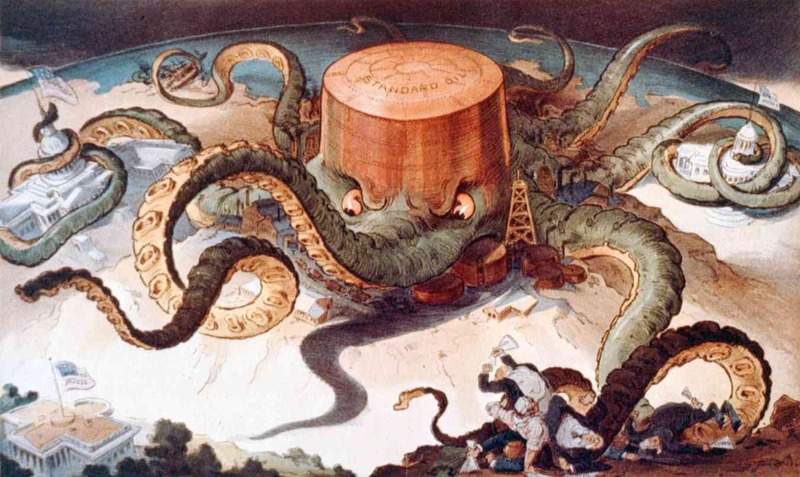 Standard Oil: Illustration from 1904. At a seminar in the Faculty of Business Administration 5 November 2013, Professor Hannes H. Gissurarson criticized the accounts on the Icelandic economy given by authors such as Roger Boyes, Robert Wade and Sigurbjorg Sigurgeirsdottir. Those people claimed that the economy had, for most of the 20th Century, been controlled by “Fourteen Families” or by an “Octopus”. The concept of the “Fourteen Families” originally came from El Salvador, that country being divided into fourteen regions, with a great contrast between a small class of landowners and the poor multitude. Iceland had however a relatively even distribution of income and was in many other respects very different from El Salvador. Some families had certainly been influential in Iceland in the 20th Century, such as the Thors Dynasty, the Engey Family and some merchant families. But powerful families had also existed on the left. Hermann Jonasson and his son, Steingrimur Hermannsson, of the Progressive Party had for example been Prime Ministers for a total of 17 years in the Century. Former Prime Minister Johanna Sigurdardottir was the daughter of a Member of Parliament for the Social Democrats and the granddaughter of a well-known trade union leader. Gissurarson pointed out that in this matter the causal connection might be different from what many believed. Perhaps families were renowned, because many individuals in them had had distinguished careers, rather than that they had had distinguished careers because they came from renowned families. The concept of the “Octopus” was also foreign by origin. It was used in early 20th Century about monopoly capitalism, but in Iceland it became a household word when the government broadcasting service in 1986–7 showed a television series on the Italian mafia called “The Octopus”. Journalists had seized the word and used it about a loosely-connected group of businessmen led by architect Halldor H. Jonsson. That group had however only controlled a few of the largest companies in Iceland, and only for a while: Many companies had been cooperatives, while others had been government enterprises, and some had been fishing firms or marketing associations for such firms. Loans to three major business groups 2005-9. Red line is Baugur clan. 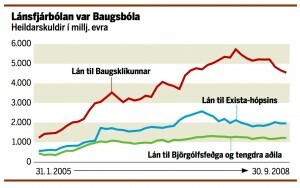 Green line is Bjorgolfur, father and son. Source: SIC report 210. Professor Gissurarson discussed the claim that in Iceland the Octopus had been replaced by the Locomotive Group as a leading power elite at the end of the 20th Century. He said that the Locomotive Group had been idealistic in origin: It had been formed in 1972 to publish a cultural magazine, The Locomotive, while the editorial board had contined to meet for lunches forthnightly, after the magazine folded in 1975. This had been a diverse group: For example, two members of it, David Oddsson and Thorsteinn Palsson, had competed for the leadership of the Independence Party in 1991. The Locomotive Group had been an innocent luncheon group, not a power elite. Professor Gissurarson also rejected some theses put forward by Robert Wade and Sigurbjorg Sigurgeirsdottir about the Icelandic bank collapse in 2008. The collapse was not because of deregulation, because the legal and regulatory framework was precisely the same in Iceland as in other member states of the EEA, European Economic Area. However, the sound management of the economy in 1991–2004 had led to much confidence in the Icelandic economy and to very high credit ratings. This had been taken advantage of by a small clan of businessmen led by Jon Asgeir Johannesson of Baugur. 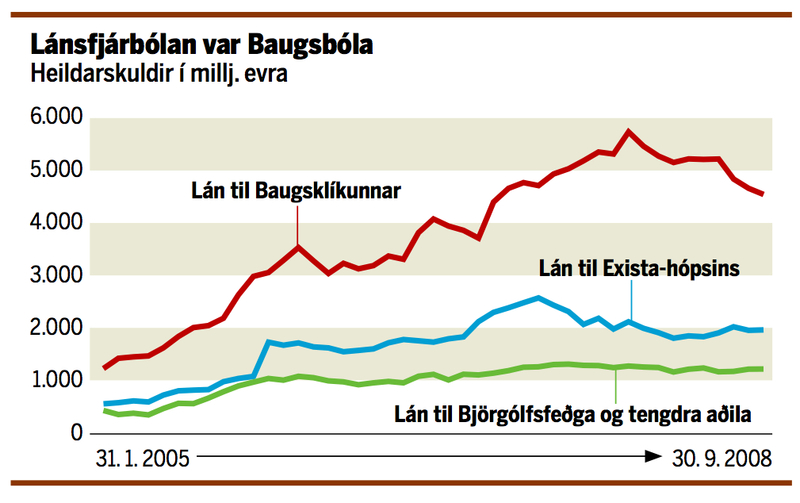 When the report by the Special Investigation Commission of the Icelandic Parliament into the bank collapse was studied, it became clear that that Baugur Clan was in a class of its own in terms of borrowing. Other business groups, such as the Exista people and the Bjorgolfur father and son, had been more cautious. Professor Gissurarson pointed out that in another way the Baugur clan was in a class of its own: It bought up the private media in Iceland and used it to attack those whom it considered its enemies. Professor Gissurarson concluded by saying that the tiny population of Iceland was both a problem and an opportunity. The seminar was well-attended, although Professor Gissurarson remarked that he missed some of the authors whose statements he criticized, having specially invited them to respond to his criticisms. A member of the audience, Bjorn Bjarnason, former Minister of Justice (2003–2009) and of Education (1995–2002), blogged about the talk. The online edition of Morgunbladid published an interview with Professor Gissurarson on his message.